Ideal Family Buys First Subaru Ascent; Is This Story Staged or Real? Subaru sells the first Ascent 3-Row to the ideal family. Is this story staged or real? Subaru of America (SOA) announced the first sale of its all-new 2019 Ascent 3-Row family hauler this week, and it seems too good to be true. The first Ascent owner is a two-time Subaru owner, traded in her 2008 Tribeca, has a growing family and they even own a dog. It’s the ideal family to get the first-ever Ascent sold in America. Does this story seem staged to you? We aren’t doubting Samantha Ernest of Pewaukee, Wisconsin, bought the first-ever Ascent 3-Row SUV, but this had to be set up in advance, right? It’s the perfect PR piece for SOA as they launch the largest vehicle ever produced by the Japanese automaker. 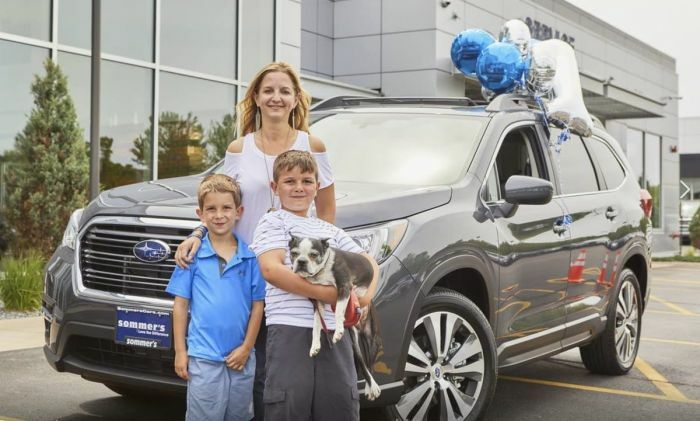 The Ernest family needed a larger three-row SUV for their two growing boys, Caden and Oliver, and they have a Boston Terrier, Brewer, who also made the trip to Sommer’s Subaru in Mequon, Wisconsin. We think Subaru knew this family was going to buy the first-ever Ascent and staged this event for the ideal family. They even have a dog with them which is one of the brand’s key marketing strategies. Who takes their dog to buy a car? Subaru also found a Tribeca owner who couldn’t wait for the new Ascent to arrive. Subaru discontinued the Tribeca because it was too small for families in North America. The press release says, “She’s (Samantha Ernest) been patiently waiting for the Ascent and following it for a year-and-a-half.” This is what Subaru is hoping for. Current owners who will trade in their smaller, Tribeca, Outback and Forester for the larger Ascent 3-Row as their families grow. Ernest says one of the primary features that drew her to the Ascent is the third-row seating configuration. “My husband, Pat Henderson, and I have two active little boys. They love sports, so we’re always running them to Taekwondo, swimming or team sports with their friends. One of the reasons I wanted this new SUV is because it has the third row. Now that they’re getting a bit older and have more friends, I need more room,” said Samantha Ernest. Subaru of America knows who their target market is for the all-new 2019 Ascent 3-Row family hauler, and the first-ever owner is the ideal family to buy one. We think this dealer alerted the company and said here’s your perfect Subaru family Ascent story. It’s a great story, but it seems staged to us. staged or not it was a marketing gimic.. but it would have made more sense if they found a family with an older gen outback , xv or forester for this. (there are lots of 3-4 time Subaru owners who hand down cars to family members) it would have carried the narrative perfectly. Agreed - staged indeed, but hey it's just a marketing ploy. I agree with Dalaz, but reaching non-legacy buyers is important as well.